You’ll want to dive in head first into this colourful, yummy candy land, especially if you have a sweet tooth and a hunger for sweet, sweet winnings! Choo Choo Choose the sweet Sugar Train and you’ll be in for a treat as you’re transported to a whimsical, candy rich, gummy bear haven. This sweet slot machine is perfect for those who are new players as it is easy peasy lemon drop squeezy to play with simple game objectives. The graphics are as bright as they are delicious and is filled with gummy bears, candy-canes and rainbows to lift your mood and brighten up you day as you play. 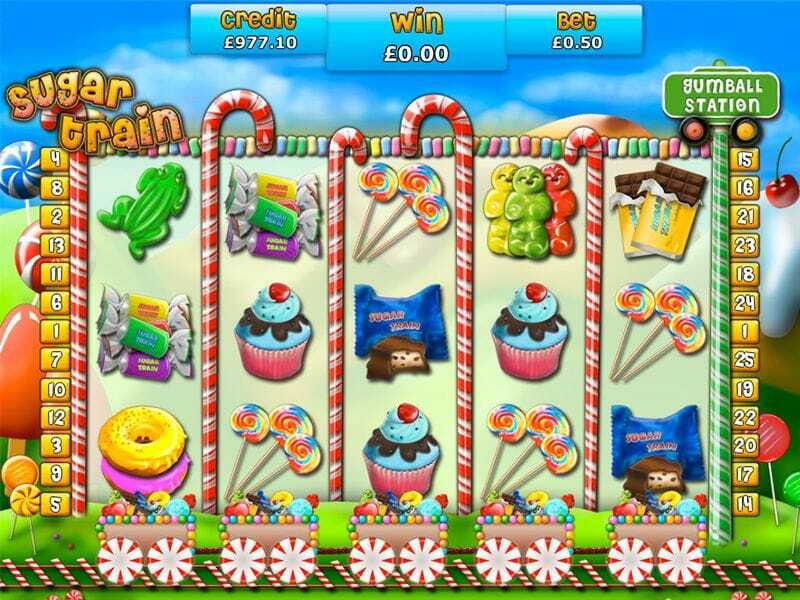 All aboard the Sugar Train for some seriously scrumptious fun right here at mega reel! 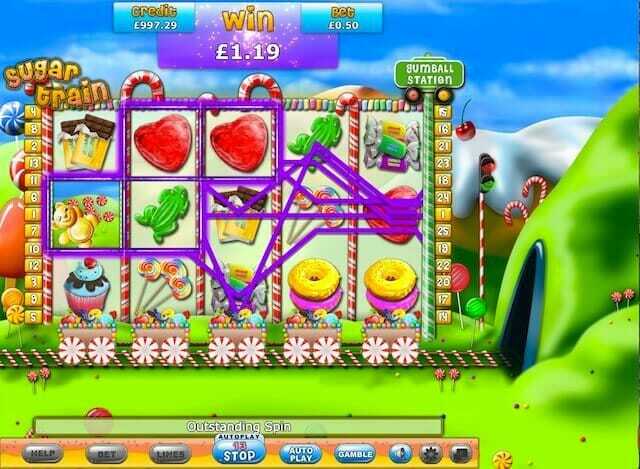 Sugar Train was developed by industry leading developer and self-professed game lovers Eyecon. They are hardly new kids on the block, as Eyecon has been developing computer games since 1997, with their first slot game making its debut in 2003. Eyecon have created and developed a whole host of timeless classic game that gamers love to play time and time again, which is their secret to over two decades of success. Click here to find more slots by Eyecon. The Sugar Train slot game consists of 5 reels set across 25-payline and features two bonus symbols that have various functionalities. You can choose the number of paylines you want for each spin and you can control these paylines using the line meter as well as using the bet meter to place your bets. Once you’re ready to play you hit the spin button, sit back and relax as you watch the reels whirl and hopefully show up some winning combinations to maximise your winnings. Sugar Train has an excellent dree spin bonus and this is triggered when 3 or more gummy bears are on the reels. You are given free spins depending on how many bonus symbols are on the reels. Even better, you can earl up to 34 free spins for every spin! Watch out for the gummy bears as they are also Wilds and can complete winning combinations and act as a substitute for all symbols, except the rainbow. Keep your eyes peeled as you play for the train carriages at the bottom of the game. The red meter is frequently activated during the game and it increases slowly until it gets to the top. Once it gets to the top, a claw grabs 5 gummy balls each with differing values from the train carriages to multiply your winnings. You can also multiply your pot of gold with the rainbow feature which is triggered when you get 3 or more rainbow symbols on the reels. The sweet features of this game are just too tempting to say no to, so gamers just keep coming back to get their sweet fix. This game sure does give you the warm and fuzzy feeling, how can it not when a cute, fluffy teddy bear is the train driver, transporting to you a candy paradise filled with gummy bears and with the chance to win a pretty penny? It’s a very popular game and with the visual delight the game renders, it’s no wonder it is a firm favourite for players. We also recommend that you play Striker Goes Wild.